There are many universal remote controls said to be compatible with every imaginable AV device, so it's hard to think what might make a new model more attractive. One For All is determined to try, though – the result is the Xsight range. The idea is to replicate the original control codes for TVs, VCRs, DVD players, PVRs, satellite tuners, CD players, amplifiers and so on, from a range of manufacturers so you can get rid of multiple remotes or replace missing or broken ones. 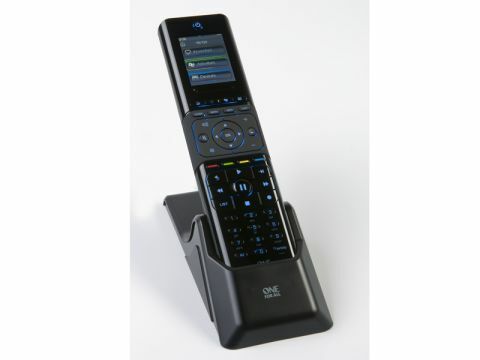 Programming of the handset is done in one of four ways: by selecting a code from the manual, downloading from the One For All website using the remote's USB connection, 'learning' from an existing remote, or by trial and error. Between these four methods you ought to be able to handle almost any device – over 1,000 manufacturers are supported. There's no printed manual. You get a 'setup wizard' running on the display (and a manual on CD). The £99.99 Xsight Colour has a 2.2in colour LCD touchscreen display, while the £129.99 Xsight Touch adds an iPod-style 'rollbar' to select menu pages using your thumb – it's nifty. Otherwise the two models are similar, featuring backlit keys and a choice of AAA batteries or a rechargeable Lithium ion battery using a desktop docking port/ charger. Xsight supports up to 18 devices and basic control functions are replicated using the remote's numeric, cursor, joypad and special controls buttons. Aided by the One For All website you can program more complex functions, including preset Activities (such as Movie Viewing or Playing Music – essentially 'macros' where several commands are grouped under one control function). You can also create a list of Favourite (Sky or Freeview) Channels. User Profiles are set to be added this month. The Xsight is a flexible device that does what it promises with little fuss. But we feel it's a bit expensive for a universal remote, and a little under-powered to call itself a system controller.